When we were planning our trip, we decided that the most efficient way was for us to take an overnight bus to Mozambique, Maputo specifically. We decided to leave exploring Johannesburg for the last few days of our trip as our flights were a return trip to Johannesburg and there was an Intercape overnight bus to Maputo. As Maputo, the capital of Mozambique was really close to Johannesburg and Nelspruit, it was a no-brainer to explore travelling overland to Mozambique. Therefore, this was our plan. Our trip was on Dec 2017. Upon landing in Johannesburg, we had half a day to change some money, sight-see or meet a couchsurfer and make our way to Park Station (apparently one of the more dangerous places in Johannesburg) at night to take the Intercape bus. There are 2 Intercape buses from Johannesburg to Maputo daily. I went to book the Intercape bus directly to Maputo for the overnight bus, starting 10 pm and supposedly reaching Maputo at 9:30 am. After choosing the locations and dates, a strongly worded message popped out. This presented a few unknowns and 2 clear issues. We needed a visa for Mozambique. Upon booking Intercape, they declared that they will not accept you on board if you do not have your visa documents ready and will not be refunded. With such a big notice, there was no way we could avoid it. There are always 2 ways for obtaining visas. Getting the visa prior to arrival.Some travellers actually make a trip to Pretoria to obtain their Mozambique visa first before heading over. They do issue it on the same day but the embassy and application are only available in the morning. We would potentially waste 2 days of our trip for this visa. The fact is most of the travellers headed there are usually doing a long trip (meaning 6 months to years) or are volunteering somewhere in Southern Africa or the regions around. It is also extremely costly to get your visa this way. I think people pay up to an excess of 120 USD. As most people do not fly into Mozambique, visa on arrival is available supposedly at the border from South Africa – Maputo but there wasn’t much clear and precise information on it. I read that from 31st March 2017, one is able to get the visa on arrival at the border of Mozambique. You can read it here: https://danatours.com/mozambique-tourist-visas-on-arrival/ and this http://www.iboisland.com/wp-content/uploads/2017/04/BR-Vistos-30-Mar-2017-14-27-25.pdf or here: http://www.travelweekly.com/Middle-East-Africa-Travel/Visa-on-arrival-now-available-in-Mozambique. Very few people are like us, just travelling around for 3 weeks and covering so many areas in Southern/Central Africa. Doing my research online and searching through the various guidebooks, I could not get a firm grasp of whether it was possible to get a visa upon arrival. Most of the sources and forums seem to point to it and based on my experience, I was sure there was going to be some way when you are at the border. I was going to take the risk. This leads me to the next problem, the transport. As we did not have a Mozambique Visa and there was no way for us to get a Mozambique visa beforehand in Singapore, we wouldn’t be able to take the Intercape Bus to Maputo. I found out that the border city was Komatipoort. I also read a blog somewhere about taking to Komatipoort (the nearest border to Mozambique from Johannesburg) and taking a normal transport over. It stops by Komatipoort, supposedly at 5.45am. Great! Seeing as they were the same route and checking the Intercape bus website, I was dead certain that it was the same bus to Komatipoort which would then proceed to Maputo. The only downside was the extra cost. It seems weird because it feels as though Intercape knows this. The Intercape bus from Johannesburg to Maputo can range from 290 Rand to 380 Rand (25 to 32 USD). Why would a truncated bus route of Johannesburg to Komatipoort, one which doesn’t cross into another country cost more or the same amount as one which goes further? I am pretty sure Maputo was 2 hours away, which means a 4 hours return. I expected the bus cost from Intercape to Komatipoort to be 3/4 the price of Intercape to Maputo. Logically, if their system or algorithm was based on demand and supply, one possible reason was that a lot of people took the same bus to Komatipoort and very few people stopped at Maputo. This I highly doubt, and I was correct because nobody stopped at Komatipoort. So I decided to book the Intercape bus to Komatipoort, obtain the visa on arrival and hopefully board back the same bus to Maputo. I could either try to buy the ticket from Komatipoort to Maputo on the spot or ask the driver/conductor. This was a risk I took. What was the worst that could happen? We would end up reaching Komatipoort early in the morning and find our own transport into Maputo. As backpackers, I was pretty certain there would be some way, whether it was shared taxi, a local bus or convincing the Intercape bus to bring us across. We were dropped off at Park Station by our couchsurfer at night and we literally ran in. There were only 15 minutes left to board the bus. As we approached the counter, there was an argument happening between the person in the counter and some customers over some lost luggage incident. The argument was really silly because the counter attendant kept repeating himself and it also felt as though the customers just wanted a refund or some freebie but they refused to say it. We stood impatiently behind. Another 5 minutes has passed. We were going to be late. Sensing our impatience, the irate customers left seeing that they were not going to be able to get anything. It was surprisingly fast to get our tickets. After showing them the online booking number, they printed the ticket out for us. I initially thought we simply needed to flash the QR code to the bus driver. I guess I was in Africa and not China. Tip: To hasten your process, print out the ticket beforehand and they will just acknowledge it. He directed us to the gate number and told us to get there now. We rushed over in a panic, not wanting to miss our bus. I expected to see everyone seated inside but instead, there was a queue to join. I did not take very good pictures because I was really scared of my phone being taken ha! The reason for the queue was because the bus conductor was manually checking everybody’s tickets. This looks like a really inefficient system. Everyone started taking our their passports and preparing their visa documents. I walked up and down the queue and looked at most of their passports and documents. Most people were going to Maputo. I assumed that the driver and conductor were registering the visa documents and tallying it to some list. “To Maputo?” The conductor asked curtly. I was cut off because I could finish and dismissed brusquely. The bus was full but pretty comfortable. I kept looking at my GPS on my phone to see where we were. Were we going to stop randomly at Komaatiport or at the border, or was the bus going to continue on? We would be secret stowaways on the bus! We reached Komaatipoort really early, around 4+am. The bus stopped at a Nandos and petrol station and I was afraid that this was going to be our stop. There were no instructions so I got off the bus for a breather, made eye contact with the bus driver and conductor and motioned if this was my stop. They just dismissed me again and motioned for me to get on, leaving me in the dark, both figuratively and literally. I was actually ready to leave but it was only just a food break for them. This was because the border was still closed. The bus continued on towards the border. As the sky started to light up, I finally saw why we stopped for so long. We had joined a long queue of vehicles even though it was only 4.30 am in the morning. The border wasn’t opened yet so everybody was still waiting. It was quite interesting that there were opening times for borders, this is the first time I had experienced this. After an hour of waiting or so and the vehicles moving at a snail’s crawl, the bus driver gave out instructions which I didn’t understand obviously. I guessed that we were told to get off the bus and walk. I enquired about my backpack but the driver simply motioned for me to go and not be worried about it. Without knowing how I was to get back to the bus, we followed the queue out of the bus. There were other people from other buses walking too. We didn’t have time to lumber around as we needed to get our visas done in time. So like kiasu Singaporeans, we raced ahead of everybody even though we had no idea where we were walking to. We followed the road until we reached a path with a gated fence on the right. We kept on the path to the right side of the gate. There will be an immigration booth to exit South Africa, everybody has to get through it. Exit the immigration booth and keep walking on the path. You will see a dirt road with lots of vehicles clogging the way. Just keep going straight until you notice a nondescript booth or a sign which says Welcome to Mozambique. Enter the immigration area. You will notice a booth and queue lines, that is the immigration booth to enter Mozambique. On the opposite side of the booth, it should be quite chaotic although it doesn’t concern you. There are a lot more people entering South Africa than leaving South Africa. It made sense because most people went to South Africa for work or holidays. You do not need to go through the immigration. Look to your right, there should be a small table. Tell any attendant around that you require getting a visa on arrival for Mozambique. You should receive a visa registration form to fill up. After filling up a form, you are required to take a picture and go through the fingerprint scanning. All of these should take around 15 minutes per person at most. Ask them how much it cost. It should cost 50 USD. If they say it is higher, ask them for the form. They have an official form which lists how much it costs. This list might be found on the wall. Pay in USD or Euros. I had USD on me, but I thought it might be cheaper to pay in Rand, but it ended up being way more expensive to pay in Rand! So silly because they simply converted 50 USD to Rand with a lousy exchange rate. Viola! Your passport should have your dark and unappealing picture of you in the passport. The visa is a dual-entry visa and valid for 30 days. It should be in your passport and you are given a piece of paper to acknowledge that you have paid for the visa (a long detailed receipt). Now, you can proceed on to the immigration booth to get your passport stamped. Exit the immigration and cross the road to the place where there are some small buildings/sim card shops and many people are waiting. We are now officially out of South Africa! I couldn’t see where the rest of our bus passengers were. Did they all finish crossing and were they already on the bus waiting for us? Surely we did not take that long. It was barely 20 minutes. I was certain the bus would be stuck behind all the vehicles and it hadn’t passed through. The guards looked friendly so we asked them if they knew about Intercape buses. He happily pointed us to where all the rest were congregating and told us to wait as the bus hasn’t passed and it would come soon. The problem was there were many different buses and groups of people. Not to be too racist, but I honestly couldn’t differentiate and recognize the Africans.I guess it is the same as them thinking all Chinese Asians look the same. I thought I had recognized some of them from the group so we asked, Intercape? They nodded nonchalantly. We sat down in the heat, hoping to get some respite from the shadows while waiting for the bus. After around half an hour, the Intercape bus finally arrived. I had taken its plate number down previously just in case. Well, it didn’t seem that we were going to stop here, so we boarded back on and went to our seats. No new customers were getting on. The engine started and we were moving once again in Mozambique, on our way to Maputo. Were we going to get a free ride to Maputo? Alas, it was not to be true. The bus conductor came up and motioned for me to go down.The driver’s area was a small claustrophobic booth with 2 big Africans almost squeezing me out of it. There almost wasn’t enough space for me to get through to the door. “Your ticket is to Komatipoort? Not to Maputo. I remember”. He started his show. He started telling me that he knew we only paid to Komaatiport and haven’t paid to Maputo. It made it seem as though we were trying to skip paying to Maputo. After which, he even took out his Intercape booklet and referred to the price, quoting that it would cost us 348 Rand from Komaatiport to Maputo by Intercape, but he will give us at a discount of 250 Rand on his own goodwill. I was extremely happy when the conversation started steering towards such a direction. This is a very familiar experience. It was within my expectations and now my problem is solved. I did not need to switch a bus and I would pay less than the cost of taking an Intercape bus from Komaatiport to Maputo. The driver smiled and shook my hand. I could have negotiated further downwards than 250 Rand but I was too tired and too lazy to. I was happy enough to make it across to Maputo without any disruption to our plan. There are 2 stops in Maputo. Maptuo and Maputo (Trop). 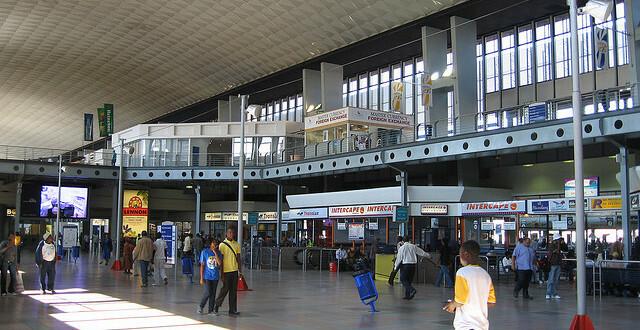 Maputo (Trop) is the last stop and the bus station and the Intercape Station in Maputo, but it is further away from most of the city sights and accommodation and a more dangerous area. You will notice most people stopping at the Maputo Stop. Therefore, this was how we made it to Maputo from Johannesburg using Intercape without getting a visa in advanced! First book a bus to Komatipoort. Tell the driver you wish to go to Maputo but wish to get the visa on arrival. Gauge the reaction upon reaching the border area. This is the crucial point. If you can get to the border and clear the customs without having to deal with your luggage, you are pretty much on track. Obtain the visa on arrival. Hop back on the bus having cleared the customs. Wait for the conductor/driver to initiate conversation with you. Settle a price with him and continue on with your journey. The bus driver drops you at Komatipoort. If he does that, you would have to initiate the conversation if you wish. Don’t worry, at that point just ask around, there are many local buses and Chapas to take you to the border and from there to Maputo. There happens to be a passenger from Komatipoort to Maputo who takes your seat. This is highly unlikely and I believe you can negotiate a standing deal. One can 100% definitely obtain the visa on arrival at the border between Mozambique and South Africa. The price is 50 USD and the cost might differ on which country you are from. For Singaporeans, it is 50 USD. Although the Intercape bus states that without the proper visa, you are not allowed on the bus, there are steps you can take to circumvent this. There are many transport options into Mozambique. You do not necessarily have to stick to Intercape, even though it is definitely the most comfortable. Similarly, there are other border crossing options. Book your Intercape bus early! Prices are cheaper if you book early and they can get filled really quickly! Well, this is somewhat bribing some might say although I do not really wish to condone bribing. The point of highlighting this is to show how things work around there and how things can be done. Whether one chooses to do it is up to you. There are a few idioms which work, if there is a will there is a way and with money, anything is possible. In fact, the seats would most likely be empty if we drop off in Komatipoort. He might as well have picked us up. Even if I had dropped off at the border, I would have gone through the visa process and knocked on the Intercape bus and asked him to send me to Maputo for a fee. Ultimately, the outcome would be the same. To me, it is the same as picking passengers along the side of the road. It really depends on perspective to see whether this is bribing and it is harmful. I see it as a harmless win-win because the system is pretty chaotic and there was no detriment to the other passengers. I just did this trip today with one small exception. I bought the ticket directly to Maputo regardless. When we boarded they asked me to change it to Komaatiport however I simply refused and said I had confirmed with the office I could indeed board but at my own risk at the border (which was true though they never asked for verification). They just hand wrote a note on my ticket stating as much and that was it. I also made sure to be early in line at the border just in case however I was back on the bus a good 45 minutes before it left. Thanks for your info. It was a great help as there isn’t much around! Good to hear someone actually did the route =D It’s great that you tried haha. Glad I helped! And yes there really isn’t much info that is why I write this haha!